An elderly man who has lived in a 120-year-old home for decades said a developer built part of a tall and skinny house on his property. Gentrifying neighborhoods comes with a cost, as property line disputes remain on the rise. Bennie Lee, age 74, lives on 2nd Avenue South in the Chestnut Hill neighborhood. He said an offset of the home was built on his property line. He believes he has spent $60,000 in court fees trying to fight it. 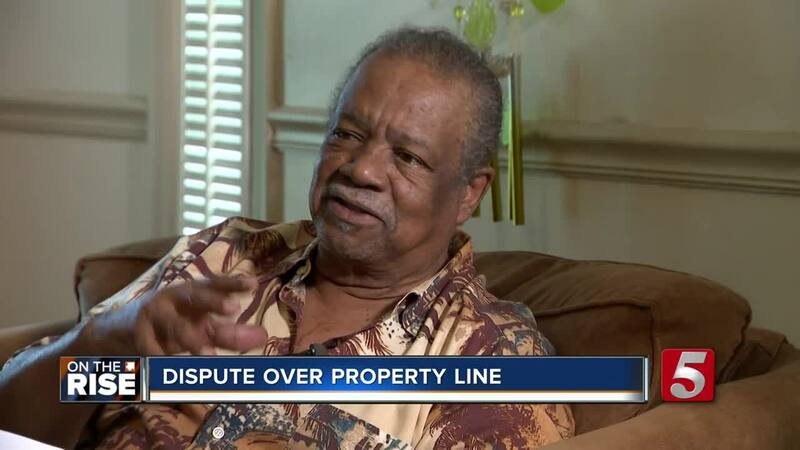 "My property line sits about a foot back into the offset here," Lee said. The developer believes this is their land, so they can do what they want. "I had a new chain length fence. He destroyed it," Lee said. Lee said he looked back to files in the 1800's to see where the property line was. "The previous owner told me that he had a zero lot line because his house was built on the property line," Lee said. After three years fighting back and forth, Lee said he just wants to be reimbursed for his losses. "They come in, to take away from me, which ya know, anything have a price on it. Let's discuss it. Don't look at me and say, 'Well okay, I can take advantage of him,'" Lee said. He feels like he's being bullied. "I think it was just an overpowering move. I don't suppose they know what I had," Lee said. "We can state that a review of the public pleadings available in court will show that Cumberland Advisory Group, prior to any building or construction, obtained multiple surveys confirming the property line. The neighboring property owner disagrees with these surveys, and as such we are resolving this matter in Chancery Court." While the court case moves ahead, Lee said he'll keep fighting. "Politics is taking over the law so to speak," he said.